The last of this seasons gooseberries have been picked form our gooseberry bushes and I needed to come up with a quick and easy recipe for them…I’d never had a Gooseberry Fool before and as far as I can tell, it’s quite a retro dish! BUT it is super yummy and quick and easy! To make Gooseberry Fool all you have to do is stew your gooseberries (as many as you have) ideally with a couple of tablespoons of caster sugar, a squeeze of lemon (to suit your tastes) and then blitz them up in a food processor! Strain the blitzed mixture for any seedy-bit or stalks that have remained. Before putting the puree back into the food processor. This time slowly start pouring cream into the processor. Add a little at a time until you have a creamy mixture the thickness of yogurt. Whilst my gooseberries and cream were blitzing I added sugar to the juices of the stewed gooseberries in a pan and let it turn into a caramel type sauce to top the Gooseberry Fool! There really are no exact amounts for this recipe, just have a tsp to hand to taste as you go and you’ll be fine. All that is required are some gooseberries, cream, sugar, and lemon! 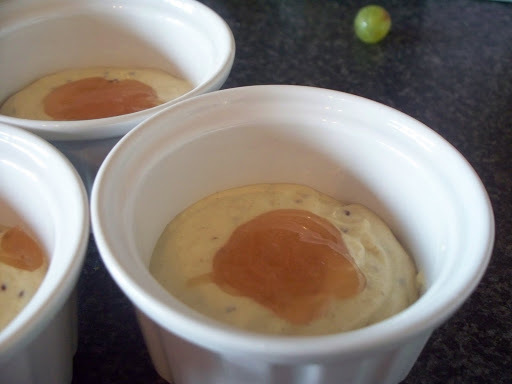 It may be retro but this Gooseberry Fool will really hit the spot.